A pink cherry blossom branch is a symbol of true love and this sensational fan favor will charm your guests. Add a beautiful touch to your event tables with these pretty white fans decorated with a burst of pink cherry blossoms on a black branch. The fans are fashioned from a light colored wood and feature a stunning intricately carved design. They have a collapsible ribbing structure with an outstretched silk fan attached. Add a unique touch to the fans by using a personalized clear sticker, showcasing your guest's name and the date of your special event, creating an exclusive gift that will be treasured for years to come. The perfect finishing touch for summer occasions, beach themed events, destination weddings and elegant garden tea parties! Size is 8" Personalized cherry blossom silk folding fan. Decorated with beautiful cherry blossoms on a branch. Fan made from light colored wood with an intricately carved design. Collapsible and expandable ribbed structure with silk fan attached. Packaged in a white box. Can be personalized with a sticker using our design template. Personalized sticker sized at 2 5/8" x.25". Stickers come on easy peel sheets sized at 8.5" x 11" (SOME ASSEMBLY REQUIRED FOR YOU TO APPLY THE STICKER TO ONE SIDE OF THE FAN). Can these be purchased for an 80th birthday party or are they just for weddings? 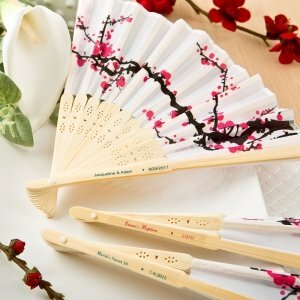 You can definitely use this Personalized Delicate Cherry Blossom Design Silk Folding Fan as a birthday favor as well. I am looking to place this order of personalized blossom fans but I don't see if they come with the gift boxes. Do they? Yes, the Personalized Delicate Cherry Blossom Design Silk Folding Fan is packaged in a white box. Can I get in different colors Instead of only white? Unfortunately, we don't have other colors or sizes available for the Personalized Delicate Cherry Blossom Design Silk Folding Fan. Are the stickers clear with coloured writing? Yes, that's correct. The sticker of the Personalized Delicate Cherry Blossom Design Silk Folding Fan is clear wih a colored print and you need to apply them on the fan. What are the sizes of the fans? The size of the Personalized Delicate Cherry Blossom Design Silk Folding Fan is 8". It can be personalized with a sticker using our design template. Personalized sticker sized at 2 5/8" x.25". Stickers come on easy peel sheets sized at 8.5" x 11" (SOME ASSEMBLY REQUIRED FOR YOU TO APPLY THE STICKER TO ONE SIDE OF THE FAN). Hi I am trying to order this folding fan, what do I need to do to personalize it? That Personalized Delicate Cherry Blossom Design Silk Folding Fan includes personalized stickers that you put on each fan.You can see a preview of your selections in the personalization section of the shopping cart, by clicking 'complete missing information'.